As you prepare for Play With Your Music, we suggest that you find a consistent, quiet spot to engage with the course materials and recordings from week to week. In the first few weeks of the course, you'll be spending a lot of time listening to your own music and the music of others. Listening in the same physical space with the same equipment will help maintain consistency from week to week. We also encourage you to listen using the best equipment you have available to you. That might mean a set of stereo speakers, or high quality headphones. Listening back to the audio files in this course using earbuds or laptop speakers is not advised because they often cannot reproduce the full spectrum of frequencies used in recordings. We're starting this course by sharing with you a process of listening deeply and critically to recorded sound. You'll want to hear all of the tiny details in your own recordings and the recordings of others! 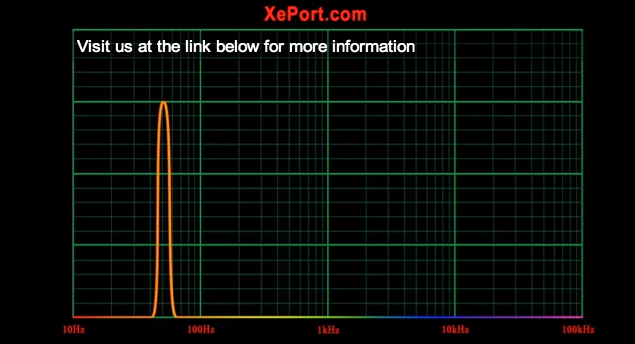 To evaluate the range of frequencies that you can hear through your listening system, click here (or on the above image) to load a test video. This video contains a test audio signal that sweeps from very low frequencies ( < 10 Hertz) to very high frequencies ( > 20,000 Hertz). To get started, we suggest that you turn your volume down to about 30% and skip to the middle of the video timeline. Once you hear the test tone, raise the volume until you hear it at a comfortable level. Then, restart the video from the beginning and take note of the approximate frequency when you first hear the tone on your system, and listen for the last frequency when you no longer can hear the tone. Use the frequency labels on the horizontal axis of the graph as your guide. This range of frequencies that your system can reproduce is not quite the same thing as the frequency response of your audio playback system. Not all speakers and headphones reproduce each frequency along the range evenly or equally. If you are interested in the more detailed ins and outs of speaker frequency response, read this article. For this course, the general rule of thumb is that listening in a quiet, consistent environment with better equipment (i.e., wide frequency range, and "flatter" frequency response), you will hear more details and come closer to experiencing the recordings as intended by the artists, engineers, and producers. To get a better understanding of the frequency range differences among various speakers and headphones that you might have, try the above activity across multiple listening systems available to you (e.g., headphones, your laptop speakers, your home stereo, etc.). Share your experiences with your learning ensemble. @Fredstuffcom suggested using the following video to test both your hearing and your headphones because it gives you the exact frequencies on the video. We agree! I found this helpful, and have bookmarked it for future pondering. Wow. I thought I knew things... But that video explaining the overtones... blew my mind. Thanks for your feedback, Conrad. "Pinning" - as exemplified by this icon: - is the way our forum designer - Discourse.org - refers to making a post stay at the top of a forum. We're sorry for the confusion. We'll I'm glad after the listening test I haven't lost my hearing after all these years! Looking forward to further participation. Conrad, this is harsh reply. Pin, pinned and unpinned are all found in my dictionary. I say we leave the advising to the instructors, and all have a good time, yes? The video was fascinating and informative. I had no idea all of that was going on inside our ear. Good stuff! Sound test was good -- it turns out my headphones have really even response (Sony MDR-V6) but cutoff at around 1:34, so maybe not as good as some others (1:37? wow). I found the 12 minute video on hearing and tones not new information, but brilliantly presented and well integrated -- something which would appeal to a wide age range. After i had done the test, youtube suggested me a few similar videos. I wanted a more accurate answer. Dont know how accurate are they though. Do you recommend any other in particular? For this video i can say i stopped hearing at 1:36 but how does it translate to Hz? Also a suggestion for the other classmates. Dont expose too much to hearing very high frequencies, you might end with a headache even if you are not hearing anything! 50hz - 20khz was about the range of my hearing ability through my system. I found the science and math video very interesting. An example: for reasons unknown a string of smaller size gives off smaller, higher vibrations than a longer string which gives off long, slower vibrations. Also the part about how our brains make up frequencies that aren't there, that really fascinates me.. (It's good enough for the brain, so why not perceive it? We hallucinate certain missing frequencies.) Fascinating stuff! My studio monitors appeared to vary in volume quite more than my Grado Labs headphones. I'm not sure if that's because of the quality of the monitor of perhaps the acoustics in the room. Regardless, identifying this aspect of the sound from each should prove useful when mixing. 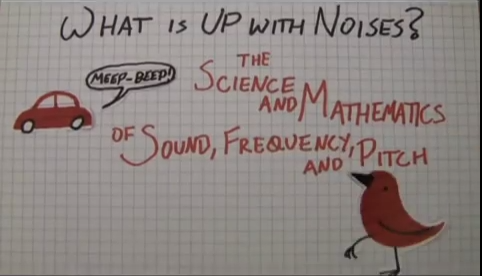 The video on how we hear sound explained the principles in a clear manner considering the amount of information provided in a short period of time. It gave some realism to timbres, fundamental frequencies, and quite a number of other topics that we're sure to dive deeper in before long. Yes! I agree wholeheartedly that we should all have a good time and enjoy the "course". While your reply was harsh it was not unkind. However, I think my comment was in keeping with that objective. Let me apologize for appearing argumentative; but, if we "students" waste time and become frustrated over interpretation of vernacular, the joy we otherwise hope to embrace vanishes rapidly. Use of "Pin", "Pinned" and "Unpinned" are simply emblematic of a larger issue. My dictionary includes the terms as well; but, those definitions have nothing to do with placing a post or comment at the top of a page until it is removed by someone. You'll note that we are also asked to "pin" our location on a map that has been provided. That usage of the word "pin" has nothing to do with a comment being "posted" does it? My advise was more of a reaction to how our language is being destroyed by people taking little care to preserve it. I'm sure you've seen any number of colloquialisms bantered about in Social Networks that are, IMHO, meaningless unless one takes the time to ask or otherwise research what it is the author is trying to convey. Especially in a MOOC where people from all over the world are likely to be involved in the learning process, reverting to use of common words used in the America lexicon makes life and learning a heck of a lot less difficult. Perhaps it is not a bad idea too that we take the effort to find out the meaning of words that we do not understand either by asking or checking around ie by googling. Isn't that what learning is about?